Saturday was World Toilet Day 2016, now let’s talk about open defecation. Sorry if that’s disturbing, but here’s an unpleasant fact: Defecating outdoors, with no privacy, is what “normal” is for one in seven of the world’s people. According to UNICEF, in 2015, 2.4 billion people did not have access to adequate sanitation facilities, including 946 million people without any facilities at all. What are their options? Another fact: As a much-beloved children’s book title declares, everybody poops. And another: Each year, 760,000 children under age 5 die from diarrhoea disease, the second-leading cause of death and a leading cause of malnutrition for this age group. A community in Ethiopia has just inched the world closer to achieving that goal. Until recently, woreda (district) 7 of Gulele city, just outside of the Ethiopian capital, Addis Ababa, was a mess. With no formal garbage disposal system, litter lined its streets and contaminated local water sources, which were unprotected — the community had no access to potable water. With few functioning latrines, children and family members were regularly exposed to human waste, which has its own dangers. On occasion, devastating diseases like typhoid, hepatitis and polio have spread throughout woreda 7. Last year alone, 697 children there had diarrhoea, and 185 were diagnosed with pneumonia. Those two diseases are the leading causes of death in Ethiopia among people of all ages. And they are preventable diseases. Because clean water, proper sanitation and hygiene are key to children’s ability to be safe in (and from) their environment, ChildFund collaborated with local authorities and our local partner organisation there in a special project, funded by a generous individual donor, to address all three in woreda 7. First, we identified a dozen communal latrines that needed repairing. The ones selected were in such bad shape — collapsing walls, broken doors, damaged roofs — that they were neither sanitary nor safe to use. The team reinforced or rebuilt walls, replaced leaky roofs and upgraded the “doors” (corrugated iron sheets) to actual doors. 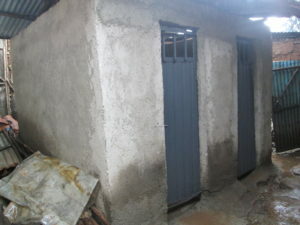 More than 25,000 people now use these latrines. We also identified 502 families with young children, whose immune systems are still developing, and provided them with safe water storage containers and treatment chemicals that purify water and protect the children from waterborne diseases. We held workshops, attended by all these families, to ensure that they fully understood how to use the tools, as well as proper hygiene and sanitation practices and how important they are. To spread this knowledge among the broader community, ChildFund and the Woreda Health Office led a three-day training of 16 community volunteers and 25 health extension workers to provide education and assistance on hygiene and sanitation, as well as other health-related issues, throughout the community. 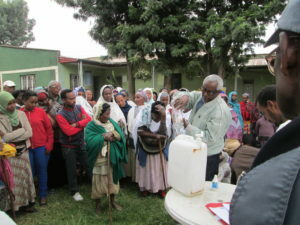 This part of the initiative was especially timely: Part of their work during those three days was to develop a health education plan tailored to the specific needs of the community itself, starting with educating families about acute watery diarrhoea and its transmission, symptoms and prevention. As it happened, the community was on the brink of an acute watery diarrhoea epidemic that had already gripped parts of Addis Ababa. 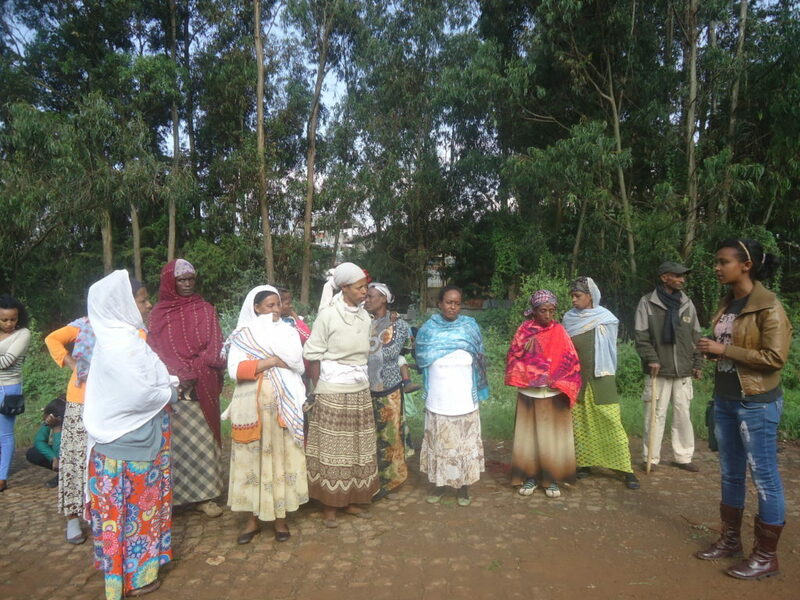 But the volunteers and extension workers were able to reach 4,261 households with the message of prevention, and woreda 7 escaped the outbreak. 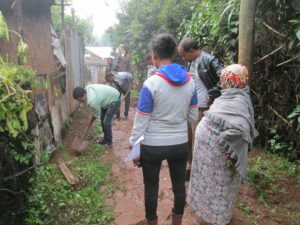 ChildFund, the volunteers and health extension workers and the Woreda Health Office also launched two community-wide hygiene and sanitation campaigns centred on community clean-up, with 200 participants. We know that latrines and water purification supplies by themselves don’t make for a sustainable solution to a community’s water, sanitation and hygiene-related needs; sharing knowledge and support are integral to making the practices stick. But the experience of living in a clean and safe environment — and the fact that they avoided a potentially deadly disease that swept through neighbouring communities — will most likely keep the families of woreda 7 on the path to a healthier (and more pleasant) future.